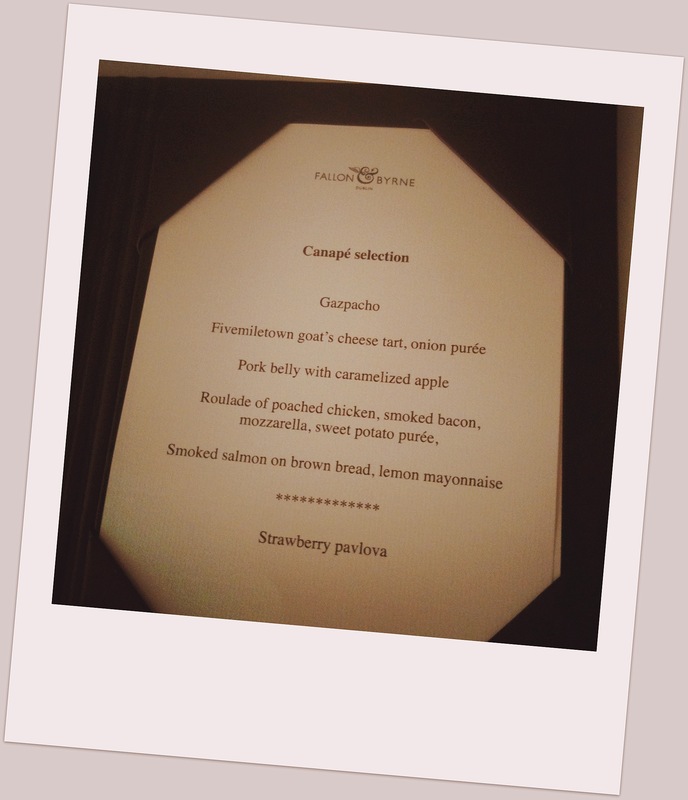 There’s lots I want to share – like the weekend at Inishfood and all the amazing food; the surprise no-menu that I had in Springfort Hall….and of course recipes that I’ve tried from my cookbook collection…….. 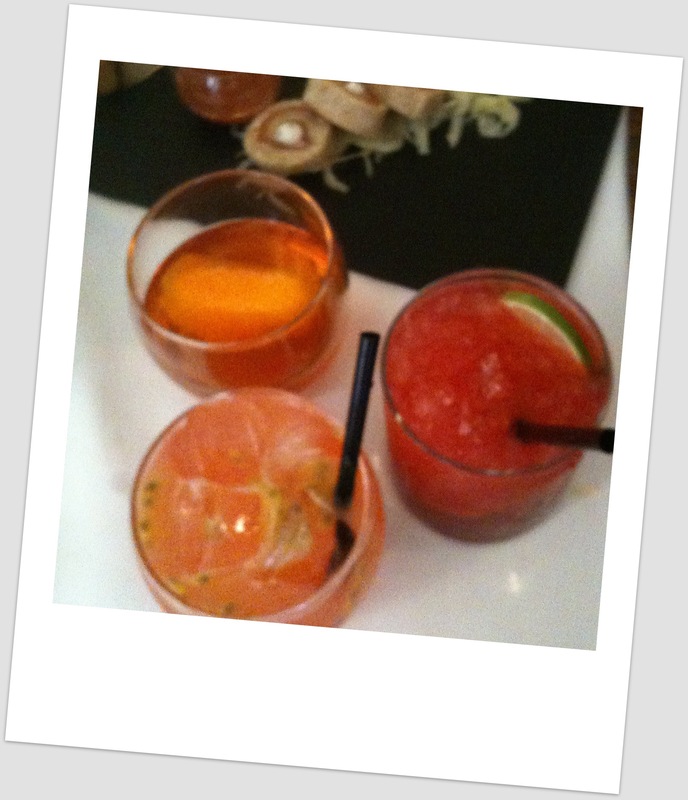 So let’s start with the most recent – Summer Cocktails in Fallon & Byrne . I love this shop – they have the most amazing selection of fresh fruit and vegetables; great variety of oils, vinegars, seasonings, savouries, cheese and chocolates to name but a few; one of the best deli counters for lunch or coffee and of course a very tempting wine cellar……. It didn’t disappoint – I met up with the lovely Aoife otherwise known as Babaduck and the debonair Paul from The ShoeBox in Kilkenny for a catch up and wander up Grafton Street (there are times I regret leaving Dublin). The sun even made an appearance for the occasion! We meet Paul Lambert the man behind the Cocktail Menu who explained that they were using the fresh produce from the food hall to add that difference to their cocktails – and on tasting we agreed! There was so much fresh fruit and herbs in the cocktails they were almost healthy. I opted for the Poppy Honeysuckle to start – a blend of Jameson whiskey, elder flower liqueur, Sauvignon Blanc, honey, pressed apple juice, lemon juice & passion fruit syrup – all served in a ‘grown up’ Martini glass. I am not a whiskey fan but this was divinely palatable! 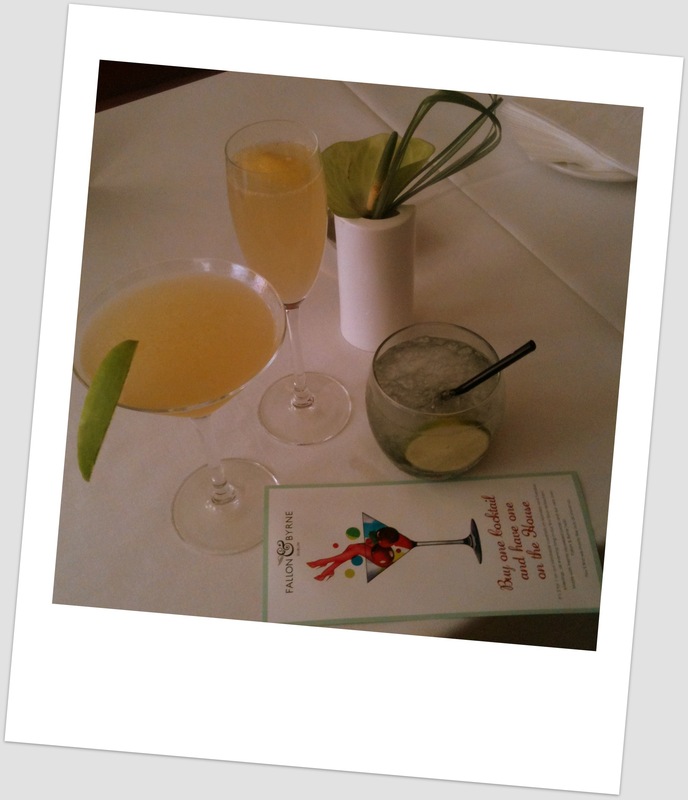 My companions chose the French 75 and the Mojito. 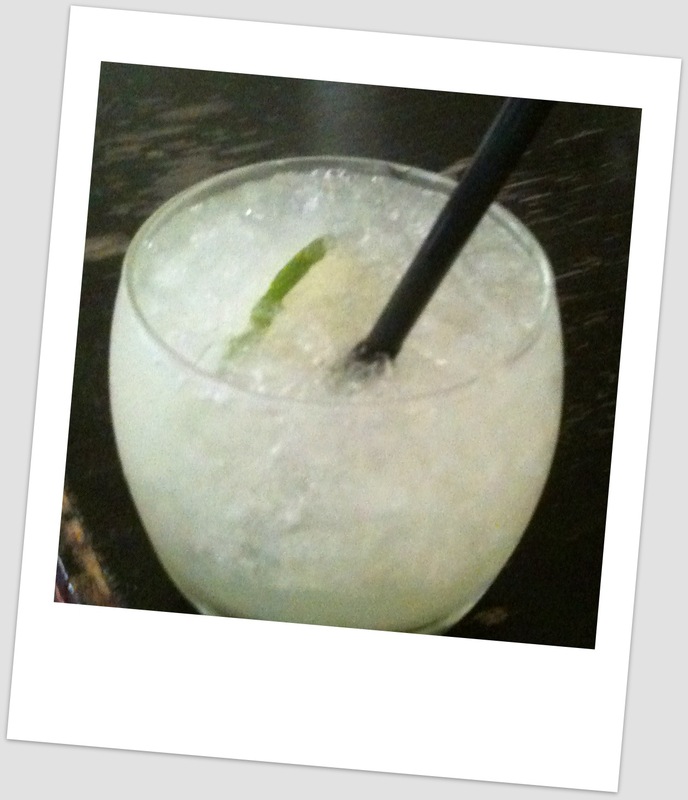 The staff were most attentive and as soon as our glasses were empty they ‘insisted’ on serving us more…. I went for the Passion Fruit & Jalapeño Margarita (jalapeño-infused tequila, passion fruit, mint and lemon juice) on the recommendation of Lily from A Mexican Cook in Ireland. I’m a bit of a chilli addict and my taste buds loved this. 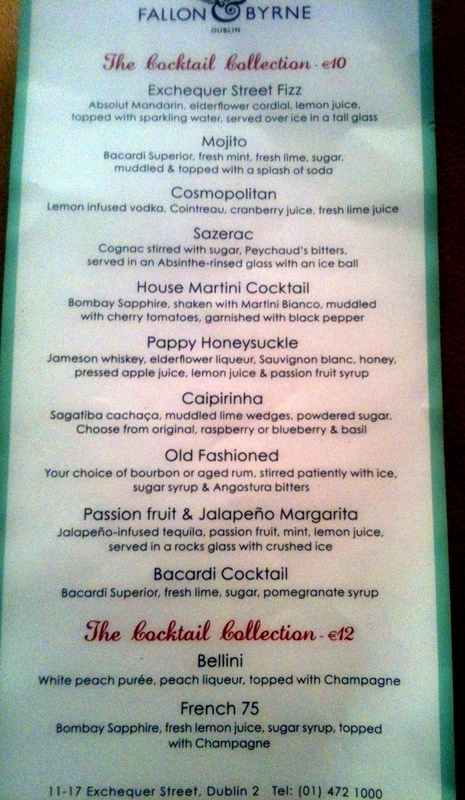 This time my companions went for an Old Fashioned & a Rspberry Caipirinha. We were also treated to some beautifully crafted canapés – naturally I was very interested (call it industrial espionage!!). I need to work on getting mine to look this good! 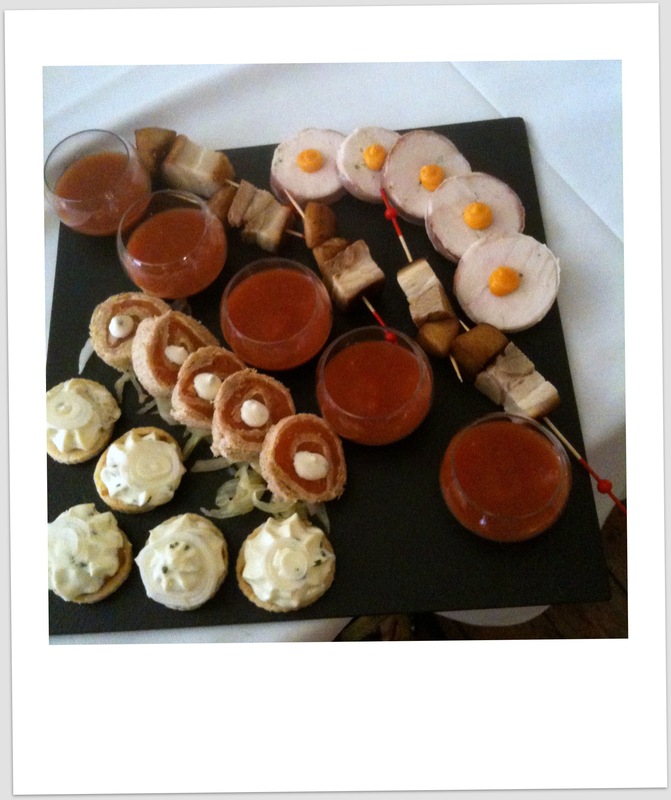 My favourite was the goat’s cheese tartlets followed by the gazpacho – I loved the cups! It was great to catch with friends and put faces to more twitter friends – Rozanne , Caitriona, Aoife (Daily Spud), Aoife (Icanhascook), Dorcas, Catherine…. Before leaving I had to try one more cocktail – a mojito on Paul’s recommendation! Then Cinders headed back to the country whilst the rest of them partied on to the Tapas Trail launch……..
Pssst they have “buy one get one on the house’ cocktails on Mondays & Tuesdays……………. PS Special thanks is also due to my ‘chauffeur’ who put up with my post cocktail giggling all the way home!